The total AR market value is expected to reach US $116 billion by 2023, spread across devices, software, content, platforms, licensing, connectivity, and more. The app celebrates the City of Toronto’s skyline from the perspective of the observation level at CN Tower and features 360-degree day and night panoramic images. How AV is moving museums forward with immersive technology. 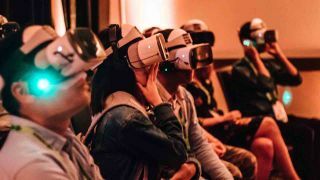 The 5G network, with extreme throughput, ultra-low latency, and uniform experience, will be the ideal solution for connected AR/VR experiences, according to market advisory firm ABI Research. Drones are slowly but surely gaining traction in pro AV. ZEISS has appointed Stampede to distribute its line of virtual reality headsets. Advanced Education has been named Canadian distributor for Veative’s educational VR solutions. At InfoComm 2018, IHSE will demonstrate an all-new solution to extend and switch immersive reality signals over long distances using Draco KVM systems. Immersive, 3D, or spatial audio systems—label them as you wish—are hardly new. But 2018 is beginning to feel like the year that immersive audio will go mainstream. Richard F. Morse is encouraging students to collaborate and push the boundaries of creativity with the latest technologies. Location-based virtual reality is seeing high levels of growth, with consumer spend expected to reach $809 million by 2022, according to the latest VR Tracker Report from Futuresource Consulting.